As detailed in the January WER report, 2018 looks to be a good year for the deepwater supply chain. The rebound begun in 2017 has continued into the New Year. Shell contracted in January for an FPSO to use in the North Sea and Golar booked a terminal contract for one of its available FSRUs. Meanwhile, Petrobras has provided details for its spending plans over the next five years, confirming it is back in the FPSO buying business. And oil prices continue to climb as a result of strong crude demand growth, curtailed crude production, declining crude inventory and heightened disruption risk. The price of Brent crude is hovering near $70 -- and $80 suddenly looks attainable. 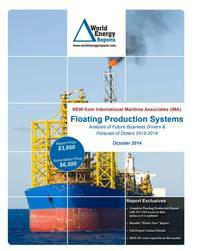 In the data section of the report are details for 223 floater projects in the planning stage, 53 production or storage floaters now on order, 297 floating production units currently in service and 29 production floaters available for redeployment contracts. Charts in the report update the location where floating production and storage systems are being planned, operating, being built and to be installed. Accompanying excel spreadsheets provide the report data in sortable format. Information is current as of 21 January.